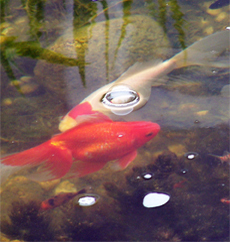 In Aquaculture, heavily stocked fish ponds can become hypereutrophic. High and toxic levels of ammonia and nitrates and high levels of organic wastes will upset the balance of the water's chemistry. Unwanted bacteria and other microorganisms may begin to grow. This makes the aquatic occupants vulnerable to many diseases, including Vibrio harveyi. Algal blooms begin to dominate the environment. The system can become anoxic. The pond's natural ecosystem cannot be maintained. Using a combination of NITRO-CLEAR nitrifying bacteria with BIO-CLEAR AQ Pro-biotic formula will address ammonia and reduce the organic sludge within the system. The pro-biotics assist in feed conversion and digestion. Excess food, feces build-up is reduced. Turbidity is reduced, water becomes cleaner. The beneficial microbes in BIO-CLEAR AQ for Ponds actively compete for the nutrients in the water. The bacteria used in BIO-CLEAR AQ's bioaugmentation process are selected specifically for their ability to degrade organic material, and nitrifying ammonia and because of the high CFU counts (colony forming units) do so at an accelerate rate. These bacteria consume the nutrients in the water. Nutrient levels are reduced. They limit the presence of pathogenic microorganisms. Ideal for use in fish hatcheries, fish and prawn/shrimp farms, lobster pens, and aquaria to combat the most common problems associated with high nutrient levels. If water volume within the Aquaculture water treatment system turns over in less than 1 week add maintenance dose each time system turns over. Effective over a wide temperature range (49° F to 105°F) and a wide pH range (6.5 to 9.0). Product performance will be adversely affected when Aquaculture System water temperatures fall below 45° F.
Initial product applications may temporarily increase BOD level (biological oxygen demand), it is therefore advisable to provide sub surface aeration to expedite the establishment of the beneficial microbial species or to use . A minimum DO (dissolved oxygen) level of 3 % is required. For high ammonia nitrogen NITRO-CLEAR for ammonia reduction - nitrifying bacteria is designed to control ammonia and nitrite. Nitrifying bacteria is designed to provide a biological oxidation of ammonia for shrimp/prawn, fish hatchery pond, ornamental koi fish pond, tropical fish pond, fish farms,lobster pens, prawn farms, natural lakes, ponds and rivers. Nitrification is the biological or biochemical process in which ammonia is oxidized to nitrite, and nitrite oxidized to nitrate.